Two years ago God placed on my heart to study the Christmas Story in greater detail than I have ever done before. It led me into a series of posts that lasted for 25 days, exploring the “Reasons” that we should be “Thankful” during the Christmas Advent Season; while at the same time, delving into the all-too-familiar stories that have become commonplace in order to gain a fresh perspective on the birth of Christ! It was an amazing endeavor, one which meant a lot to me in my personal walk with Jesus who truly is the Reason for the Season! Have you ever thought about that? What about Joseph? How did he feel but all of this? Not many people give him much thought, including the Bible which has very little about this man who God deemed worthy to be the stepfather to His Son. Joseph has no place in the Gospel of Mark or John. In the Gospel of Luke he is only mentioned a couple of times. It is only in Matthew that we find any information about this incredible man (see Matthew 1:18-25 and Mathew 2:13-23), which is not a lot. In the Christmas Story, Joseph is the unsung hero that handles all the logistics of getting Mary to Bethlehem and finding lodging for her to have the baby. Then when their lives were in danger, Joseph led them to safety to Egypt while Herod was alive. And then he was responsible for bringing them out of Egypt to Nazareth. Nowhere in the story does he get any recognition and once they moved to Nazareth he is only mentioned one more time in Luke 2:41-52. That’s just crazy to me! As I was thinking about this humble carpenter a question came to mind…What if Joseph had said no? None of this would have been possible if Joseph had hardened his heart. If you are not familiar with that phrase, it simply means to turn off your emotions and stop feeling kind or loving towards someone. I love “what if” stories and how they examine how different life would be if one thing was changed. What if…when the Angel of the Lord appeared to Joseph in a dream he refused to be a part of the plan and closed his heart to what God wanted to do through him? I don’t think anyone would have blamed him if he had. I mean what would you do if the woman you were betrothed to showed up pregnant saying that an angel visited her and that she was carrying God’s Son who was the long-awaited Messiah? That is a lot to take in! Nothing could have prepared him for that news! As Joseph was faced with a very pregnant fiancé which he had not part of and all of his plans for the future were ruined, he could have yielded to doubt and speculation, but instead Joseph accepted God’s call on his life. Maybe you are like Joseph and life has not gone the way you had expected whether that be the loss of a loved one, a physical illness or a betrayal from someone you trusted. Maybe there is not much happening right now to be joyful about and maybe the last thing you want to do is celebrate the birth of God’s Son because of how hopeless your situation is. I would like to encourage you today that you have a choice just like Joseph…you can allow circumstances to rob your joy or you can look up to a Heavenly Father who wants so much more for your life! If this Christmas season you find yourself alone and hopeless, feeling as if you do not belong, KNOW THIS…Jesus came to give us not only life, but Life in ABUNDANCE…the offer is open to all who will receive the free gift of salvation if you will trust Him today! The Salvation God provided through His Son is for everyone! This Offer NEVER Ends!! Get your life on the right path for FREE when you accept Jesus Christ as your savior. Lord I am a sinner. I have tried to run my life and failed, I cannot do it on my own. I need a savior. Please wash me, cleanse me, and create in m a new heart. I am sorry for my sins and I believe that Jesus dies as the payment for those sins. Take my life, I give it to you. In Jesus’ name I pray, Amen! If you prayed that in earnest, I have great news! You are now a son or daughter of God! 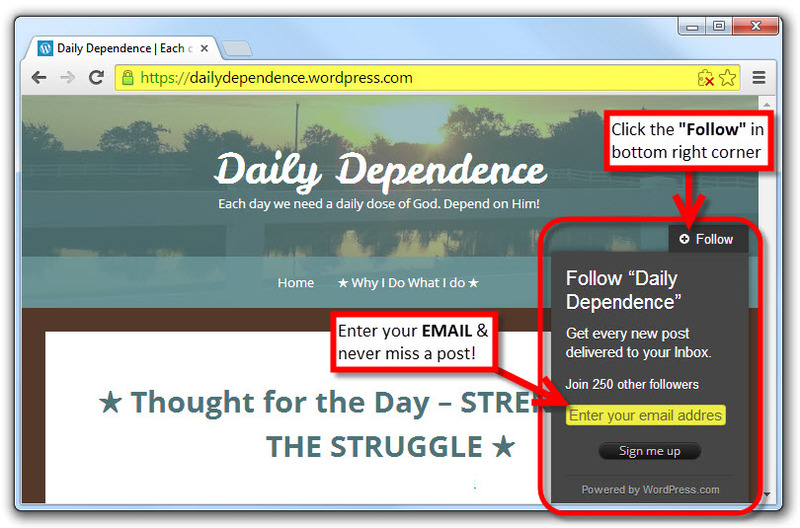 And I would love to help you along in your decision, just contact me at dailydependence@gmail.com. Can the same be said of you? If not, you can choose a different path if don’t harden you heart! Today If you hear the Holy Spirit calling you to action, do not harden your heart because you will miss the opportunity of what God wants to do in and through you! We celebrate Christmas today because a humble carpenter named Joseph didn’t! The message is called “Serving; The Key To Abundant Life” by Barry Parker in which he shares the importance of incorporating the (4) serving environments seen in Jesus’ life – personal devotion to the Father, serving the crowd, serving the Spiritual Family and serving the inner circle could be the secret to abundant life.